Amazon, Uniregistry and Verisign were among the luckiest companies competing in yesterday’s New gTLD Prioritization Draw, our preliminary analysis indicates. ICANN spent nine and a half hours last night pulling lottery tickets from a drum in order to determine the order in which it will evaluate, negotiate and delegate new gTLD bids. Applicants representing 1,766 applications bought tickets, a 92% turnout. Internationalized domain names were given special priority, but all other participants were treated equally. A few hundred people — including Santa Claus, there to represent Uniregistry’s .christmas bid — showed up, with many more participating remotely. Not many people stayed the course, however. In introductory remarks, ICANN CEO Fadi Chehade promised that the Draw would be “as boring as possible”, and it kept to his promise. “I think it went really well,” ICANN’s new new gTLD program manager, Christine Willett, told DI today. I’ve spent much of today drilling into the results of The Draw, using the DI PRO New gTLD Application Tracker, and here are some of my findings. Uniregistry won the most contention sets. Uniregistry, the portfolio applicant owned by domainer Frank Schilling, won more contention sets, in percentage terms, than other volume applicants. This table shows the performance of the top 10 applicants (as measured by the number of contention sets they’re in). Getting the best draw number in a contention set is of course not indicative of any skill or of the quality of the applications, it just means the applicant got lucky. Neither is it an indication of whether the applicant is likely to ultimately win their contention set; myriad other factors are in play. There may even be some advantages to poorer draw numbers. We’ll get to that later. Amazon is the luckiest portfolio applicant. Amazon was the most successful applicant in the Draw of any company applying for 20 or more gTLDs, as measured by average prioritization numbers. The average for each applicant is of course affected positively by the number of IDN applications it filed, and negatively by the number of applications for which it opted out by not buying a ticket. Amazon applied for 11 IDNs, increasing its average score, while Google did not buy tickets for 24 of its applications, substantially reducing its portfolio’s mean priority. Likewise, Famous Four Media did not buy tickets for 12 of its applications. Dot-brands fared less well, on average, than open gTLDs. Single-registrant TLDs (which includes dot-brands and generic strings with single-registrant models, such as Google’s .blog application) had an average priority of 983, compared to 921 for TLDs we’ve identified as having “open” registration policies. Verisign’s clients did better than most other registry back-ends. Of the registry back-end providers named in more than 20 applications, China’s KNET fared best, with an average draw number of 328, according to our data. That’s to be expected of course, due to the inherent bias in the process towards IDN applications. Of the rest, Verisign topped the list at 913 (to be expected again, given its own dozen IDN gTLD applications), followed closely by KSRegistry at 915. 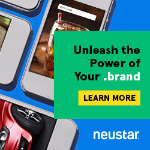 Minds + Machines got 930, Demand Media 942, Internet Systems Consortium 947 and Neustar 953. 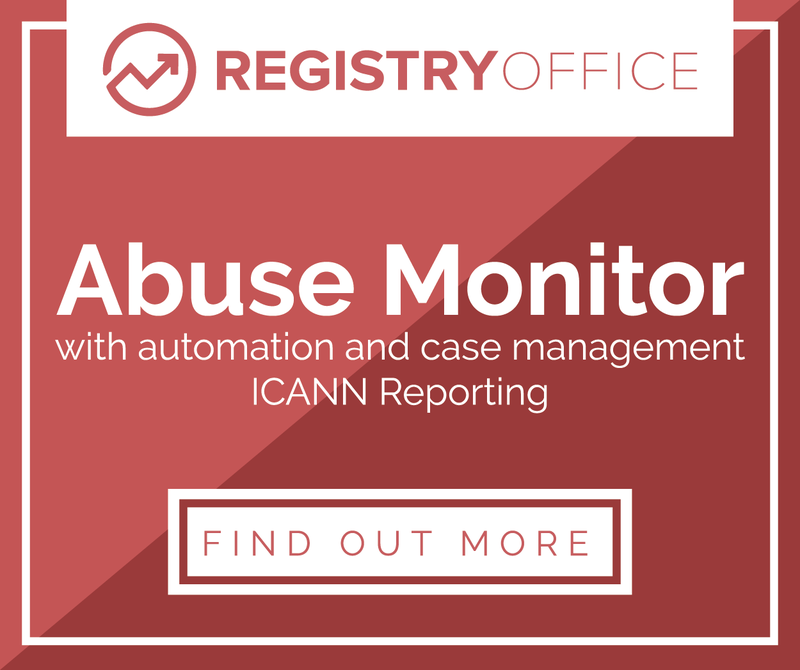 OpenRegistry was unluckiest, with an average of 1,207, preceded by Google with 1,050 and GMO Registry with 1,027. CORE scored 1,000, ARI Registry Services 1,007, CentralNic 983 and Afilias 994. 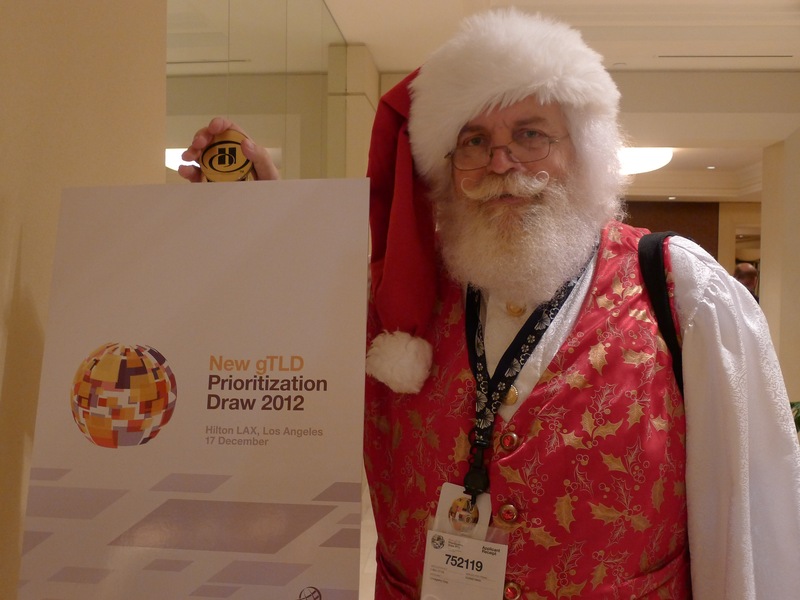 ICANN’s New gTLD Prioritization Draw has an unexpected visitor. Santa Claus himself has showed up, apparently as a representative of Uniregistry’s uncontested bid for .christmas. Here he is fraternizing in the lobby of the LA airport Hilton with ARI Registry Services CEO Adrian Kinderis. 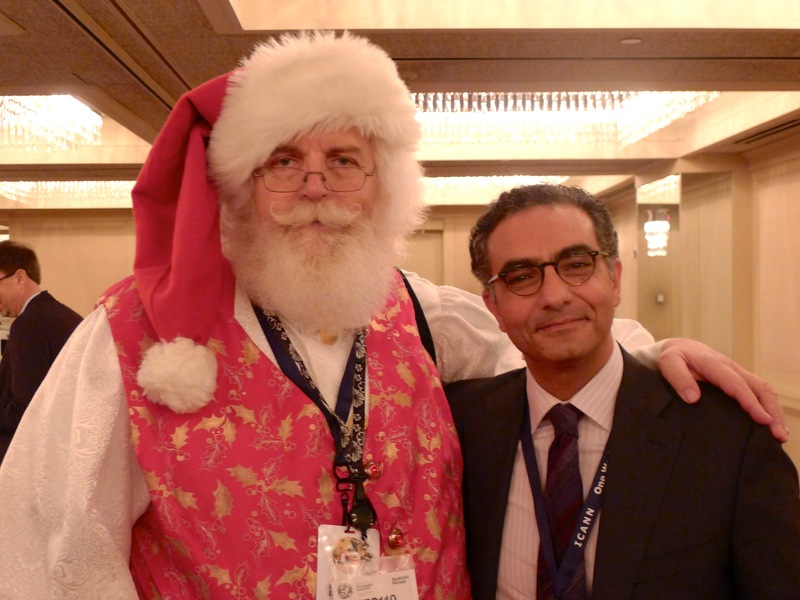 And here he is with ICANN CEO Fadi Chehade. The surprise* guest is believed to be responsible for all the sherry missing from ICANN media chief Brad White’s mini-bar. The Draw kicks off at 1pm California time (9pm UTC) today and is expected to last at least eight hours. *It may not have been a total surprise, given that Santa appears to have sensibly preregistered for the event.